There are so many different dry foods available these days; it’s hard to decide which one is best for your dog. Some of these foods are full of artificial colourings and flavourings, and have little nutritional value. But Henry and I have discovered a new food called Lathams which is a wholesome, hypo-allergenic veterinarian approved dog food tailored to meet the differing needs, different breeds, sizes and ages of dogs. The natural recipes will keep your dog in tip-top condition; they are rich in meat and contain no added artificial colours or preservatives and are free from ingredients, such as wheat, soy and dairy. We were recently sent some sample bags of Lathams for Henry, Skipper and Bandit to try and they definitely gave it a ‘paws’ up. This is Henry with the Lathams Adult Lamb & Rice food, which he absolutely loved. I had trouble taking this photo because he kept trying to break into the bag! Lathams Adult is available in four varieties – Adult Lamb & Rice, Adult Turkey & Rice, Adult Large Breed Lamb & Rice and Adult Large Breed Turkey & Rice. Lathams Adult contains the correct proportions of carbohydrates, proteins, vitamins and minerals to maintain your dog’s excellent health. The V-Plan formula also adds chicory to gently assist digestion. The Large Breed varieties also includes proteins that are more digestible and that can help maintain your dog’s muscle mass, with glucosamine and chondroitin to support joint health and mobility. It is obviously very reassuring to know that this food contains everything your dog needs to stay healthy, with a lot of work going into it to ensure that the food is well-balanced yet still tasty for your dog. 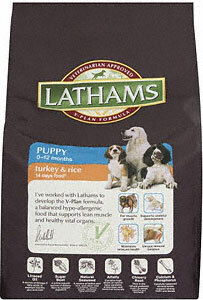 All three dogs enjoyed the Lathams food, including Skipper who is quite fussy with his food. They all got very excited when they saw the Lathams bags, with Bandit spinning round and round with excitement! Henry and Skipper have tendencies to eat their food far too fast, sometimes choking, but the small pieces of this food meant that they managed to eat it much easier. Flavour-wise this food was very popular, they only tried it over a short amount of time, but I don’t think they’d have got bored of it even if they were fed it on a long-term basis. Bandit does sometimes go off food, but with two different flavours available you can rotate it so that your dog stays interested in the food. Both Henry and Skipper have sensitive stomachs, but Lathams suited them well. They showed no ill-effects during the time they tried this food, with regular solid stools. Bandit also seemed to be a bit less windy, which was an added bonus! 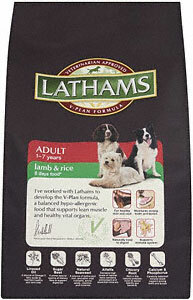 Lathams is also available in several other varieties, so there is bound to be one to suit your dog. The other varieties are – Light Turkey & Rice, Sensitive Lamb & Rice, Mature Turkey & Rice, Puppy Turkey & Rice, and Puppy Large Breed Turkey & Rice.